Jats are given reservation because they did violence and from here conclusion comes "violence is the key to get the demands fulfilled. But not true. 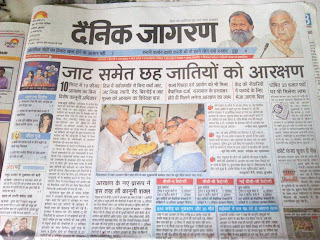 Today jat did violence for reservation and tomorrow other caste people will do violence and what will government do ??? Government will accept all the demands instead of taking strict action who are doing violence. Violence is very bad. Government should give shoot at sight order if any body found doing violence. 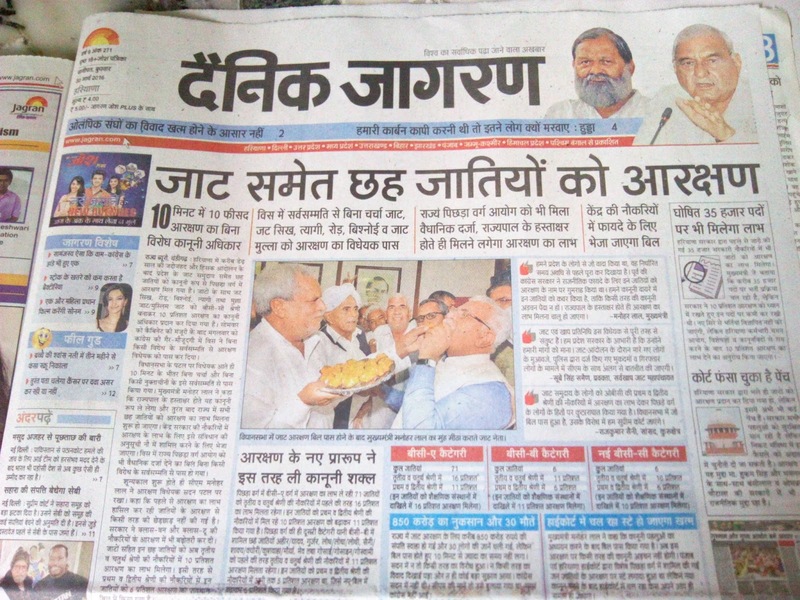 From here it is clear that reservation is given to the people who are having ability to do violence. Do violence and get reservation. But this is very bad for us and our country. Violence is always bad. We should always follow the path of non violence. The father of our nation Mohandas Karamchand Gandhi also said, following the path of non violence is the best method to get our demands fulfilled if they are important and good. Violence always leads to blood shed. God made all the people equal and that is why all should be treated equal. Reservation was given to Indians many years ago and there was a condition that this reservation will for only 10 years but due to some selfish politicians this rule failed. 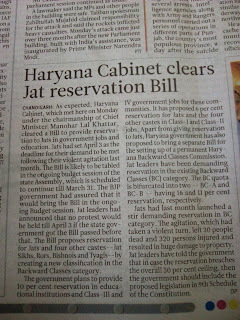 They increased the time period of this caste based reservation system. today is two friends are discussing about reservation system then war begins between them if they belong from different categories. The one will favor this caste based reservation system and other will oppose. Like this the war begins. To stop this it is very important to erase the name of caste based reservation system from India. It is very important for the countries development. Reservation should be given to those who are poor and need reservation. It is very unfair done to general category people. There are many general category people who are poor and this reservation system act as speed braker in the path of achieving their goal. 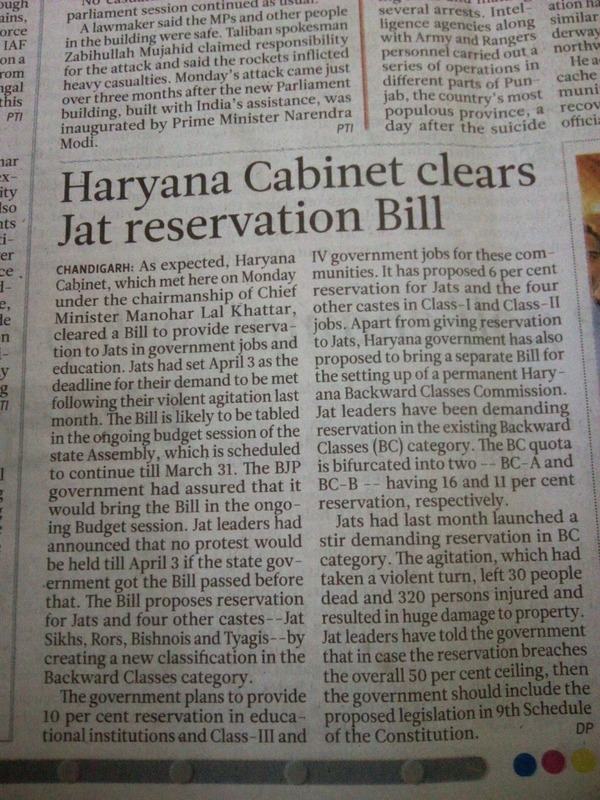 Instead of demanding reservation jats should demand for no reservation. People demanding for no reservation shows that people is educated and wants equality.